If you're dropping numbers on the scale, but not the tape measure, don't despair. Eventually, you'll lose inches as well, but the rate at which you lose them and where may depend on your genes, whether you exercise and what exercises you do. 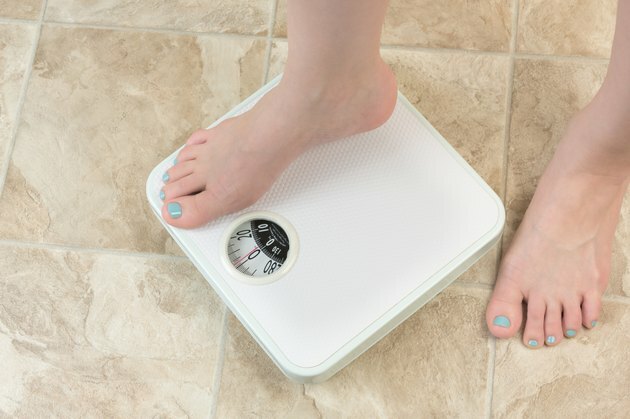 Inches -- and even pounds -- are not the only measure of improvement. Cardiorespiratory endurance and percentage of body fat are better measures of true physical fitness. When you lose fat, you lose it all over your body, but when tracking improvements, you may be measuring just your waist and hips. The waist is one area where fat tends to accumulate for men and some post-menopausal women, while pre-menopausal women often accumulate fat in the hips and thighs. If you're following a safe weight-loss program of no more than 1 to 2 pounds per week, the little bit of fat loss apportioned to those areas won't be as noticeable in the beginning as other areas with less fat accumulation. The first thing you may notice is that your rings start slipping because your fingers carry considerably less fat than other parts of your body. Your hips and thighs will be the last to show noticeable improvements. While it may sound counterintuitive, dieting without exercise can actually cause you to lose inches faster, but it's not the best way. This is because cutting calories without engaging in fat burning cardio and resistance work can lead to as much as 25 percent of your weight loss coming from muscle. While muscle is more dense than fat, meaning that a pound of muscle takes up less room in your body than an pound of fat, it still takes up some room. If your fat cells shrink, and the area is not filled with lean muscle, you're more likely to lose inches on the tape measure. However, your fat-to-lean tissue ratio could be worse than before your weight loss, you're more likely to suffer saggy skin and you'll have less stamina. Ab and core work are essential for good posture, back health and the ability to engage in other exercise, such as fat-burning cardio and resistance training for other parts of your body. But doing crunches and crunch twists without employing proper technique will strengthen your rectus abdominis but not your deeper traverse abdominis. This deeper muscle is what pulls your ab area in. To target the transverse abdominis, exhale and pull your navel toward your spine during the lift portion of your exercise. In addition, some women find that lateral bends and dips to strengthen their obliques actually add girth. In that case, exercises that involve rotation of the upper torso can be more effective. Calories aren't the only intake issue to monitor. The dietary changes you make to lose pounds on the scale could add inches to your girth through bloating that affects your waistline. Joy Bauer, RD, writing in "Woman's Day" says that sugar substitutes can cause gassiness as can chewing gum to quell your appetite. Even healthy foods such as broccoli, lentils and whole grains can add to the problem, while carbs can cause you to retain water. Bauer suggests cutting down the amount of carbs by adding some protein to pasta dishes and cooking the offending vegetables rather than eating them raw. You can replace sugar-free drinks with ginger, peppermint or fennel teas that tend to cut back on bloating. CNN Health: When You're Losing Weight, Where Does the Fat Go?